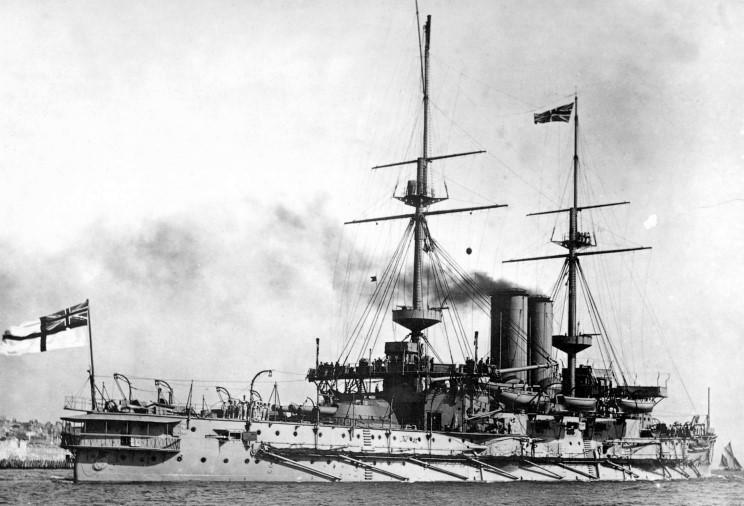 At the start of World War I all major navies had significant numbers of pre-dreadnought battleships which, though in many cases only eight or ten years old, had been rendered wholly obsolete by the commissioning of HMS Dreadnought in 1905. This, the first turbine-driven, all-big gun, battleship, mounted ten 12” guns, compared with the almost universal armament of four 12-inch guns for the average pre-dreadnought, and set the model for all subsequent capital ships. The painting on the left, by William Frederick Mitchell, shows HMS Prince George, commissioned in 1896, is typical of the type and is seen here in glorious “Victorian Livery”. 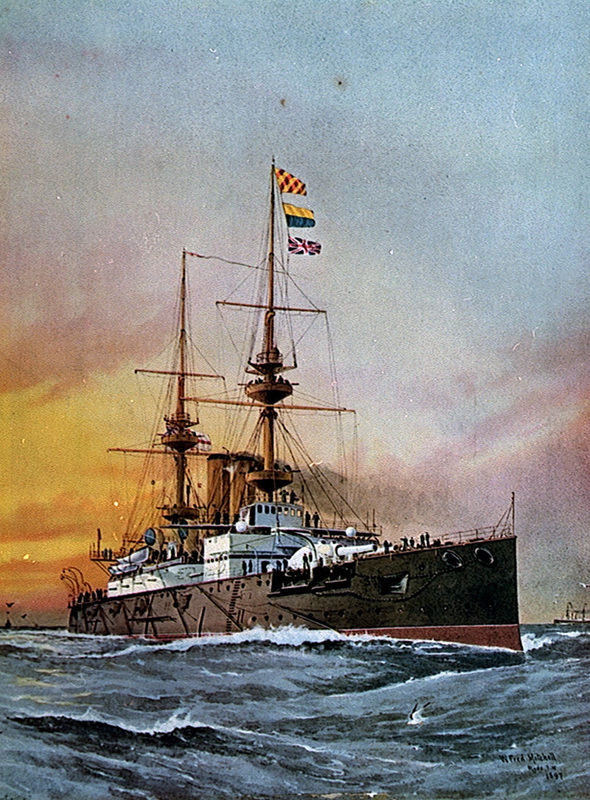 By the outbreak of war in 1914 large numbers of “dreadnoughts” – the name had already come to symbolise a type – were in service in the larger navies. Putting obsolete pre-dreadnoughts into a battle-line which would have to face much more powerfully-armed dreadnoughts was likely to be little short of suicidal. In 1914 the Royal Navy still has 39 pre-dreadnoughts while the French Navy had 26 (including several more heavily-armed “semi-dreadnoughts”). It was recognised that though they were unsuited to battle-fleet service they might still prove of value in secondary duties such as shore bombardment. In such cases low speed would be less of a concern and each ship would be capable of bringing four 12” weapons into play, plus large numbers of lower-calibre weapons. It was the availability of large numbers of such pre-dreadnoughts that contributed to the decision to attempt forcing a passage through the Turkish-held Dardanelles Strait in 1915. Success in establishing a sea-route to the Russian Black Sea coast would allow supply of weapons and munitions to often-underequipped Russian land forces – and indeed some have argued that had this been achieved Russia might not have collapsed as it did in 1916/17 and that the Bolshevik Revolution might not have occurred or have been successful if it still did. There also appears to have been some thinking that, in view of the large number of obsolete pre-dreadnoughts available, significant losses could be tolerated to achieve success. This argument ignored the fact that these ships carried large crews, and that the sinking of any one would mean a devastatingly high – and unacceptable – death-tolls. The purely naval attempt to force the Dardanelles on 18th March 1915 saw no less than sixteen British and French pre-dreadnoughts, plus the new 15” dreadnought Queen Elizabeth and the lightly armoured battle-cruiser Inflexible advance up a strait that narrowed from four miles to one in some ten miles. The result was a disaster. Under fire from Turkish shore-batteries, and heading into upswept minefields, two British pre-dreadnoughts (Ocean and Irresistible) and one French one (Bouvet) were lost in little more than an hour. The Inflexible – which should not have been there, as speed rather than armour was intended as her protection – survived after hitting a mine. The loss of the Bouvet was particularly spectacular, blowing up and sinking in less than two minutes and taking 660 men with her. The impracticability of the scheme was finally realised and the massive naval force was withdrawn. The decision was now taken to land troops to capture the Gallipoli Peninsula that flanked the Dardanelles and poorly-planned and inadequately-supplied landings were made at several points on April 25th 1916. None of the forces landed reached their first-day objectives. The Turks managed to hold, to flood in reinforcements and to establish a trench-deadlock no less intractable than that on the Western Front. The eight-month agony of the Gallipoli campaign had begun, ending only with full evacuation of Allied forces in early 1916. The role of the pre-dreadnoughts after the failure of March 18th was to be shore-bombardment in support of the landings, and thereafter of the forces onshore. Over-optimistic assumptions were made about the ability of naval guns to take-out pin-point targets – which was what the troops onshore needed – and the results were wholly incommensurate with the risks run by the ships involved. Three further British pre-dreadnoughts were to be lost before the decision was taken to withdraw them from the beaches. The ability of the enemy to strike back with either surface or submarine forces was wholly under-estimated, and indeed the arrival of a German U-Boat, the U-21, came as a very unpleasant surprise. HMS Triumph and HMS Majestic were to fall victims to her torpedoes on May 25th and May 27th respectively. The first of the losses off the Gallipoli beaches was however due to surface attack. Ever since the automotive torpedo had come into service in the late 1870s the possibility of torpedo-craft penetrating anchorages under cover of night was recognised as a major threat. The Russo-Japanese War of 1904-05 had indeed begun with exactly such an attack by the Japanese even before war was declared. 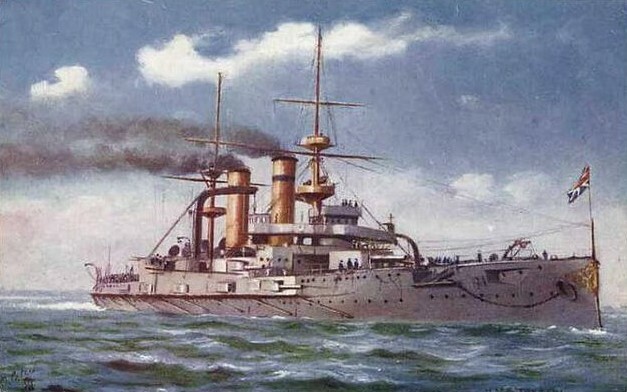 It is therefore surprising that lack of alertness – perhaps even complacency – may have characterised the sinking of the pre-dreadnought HMS Goliath in the early hours of May 13th 1915. Of the Canopus class, the Goliath was a typical pre-dreadnought. Completed in 1900, of 13,000 tons and 430-feet long, she carried four 12-inch guns, twelve 6-inch and a large number of smaller weapons. She had served off the East African coast earlier in the war but was recalled to participate in the attempt on the Dardanelles. Her crew was over 700. She had provided fire-support for the landings on April 25th and continued to do so thereafter, sustaining light damage from Turkish shore batteries. On the night of 12th-13th May she was anchored in Morto Bay, close to Cape Helles, the southern tip of the Gallipoli Peninsula, in company with a similar vessel HMS Cornwallis. Five destroyers ad been assigned to protect them and visibility was low due to fog. 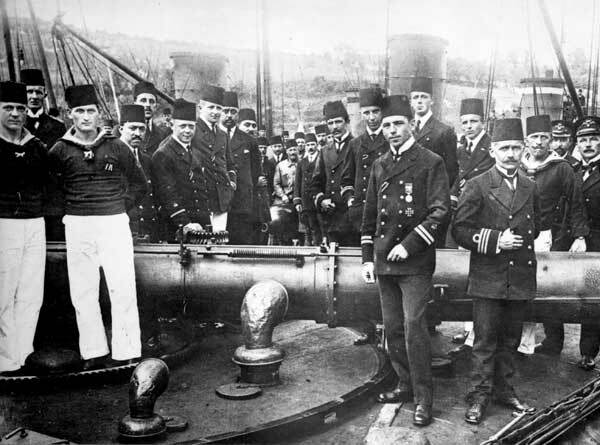 Following a period of stagnation, under-investment and a lack-lustre performance in the Balkan Wars 1912-13 the Turkish Navy was in the process of re-equipping in 1914. Britain’s refusal to deliver two dreadnoughts constructed in British yards and already paid for (and taken into British service as HMS Agincourt and HMS Erin) was a contributing factor in Turkey entering WW1 on the German side. Delivery had been taken of other new vessels however, most notably four modern torpedo-boats built by Germany’s Schichau-Werft company . These had originally been ordered for the Imperial German Navy but in 1910 they were sold, before completion, to Turkey. They were impressive vessels, designed only for one purpose, that of attack. Of 765 tons and 243-feet long, their two turbines delivering 17,700 HP, and 26 knots, they carried three 18-inch torpedo tubes as well as two 3-inch and two 2.25-inch guns. It was one of these vessels, the Muâvenet-i Millîye (National Support) that was to be the Goliath’s nemesis. 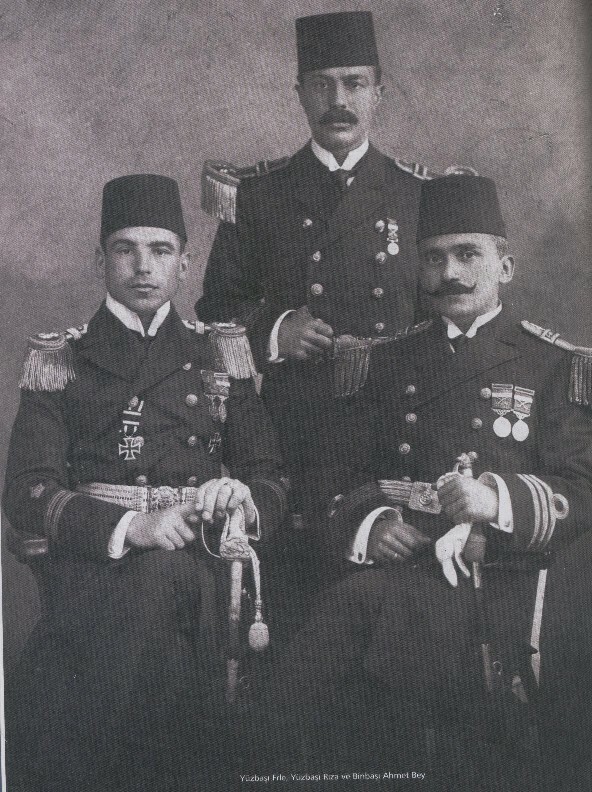 Though the Muâvenet-i Millîye was commanded by Senior Lieutenant Ahmet Saffet Ohkay , a German officer, Lieutenant Rudolph Firle, one of many seconded to the Turkish Navy, was assigned to the vessel to give specialist advice on torpedo attack. Taking advantage of darkness and fog patches the torpedo boat passed through the Turkish minefields in early evening and then anchored under cover of the Turkish-held Gallipoli shore about seven miles north-east of the anchored pre-dreadnoughts. 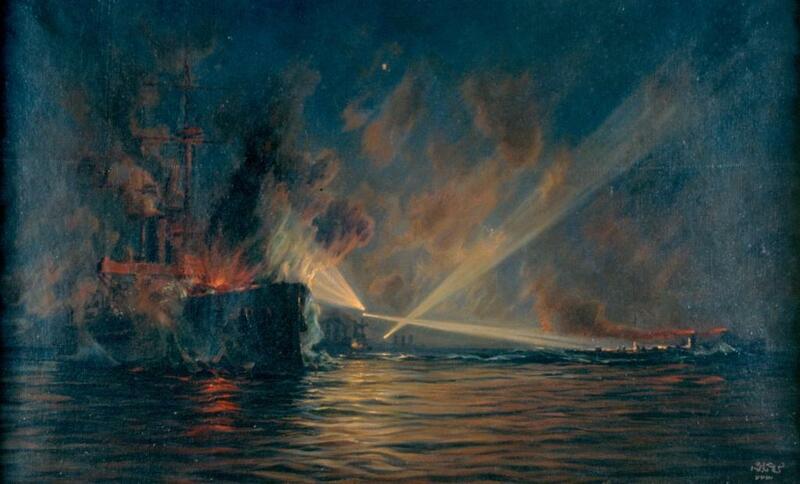 She remained there until shortly after midnight and in the meantime, around 23.30, the searchlights sweeping the anchorage from the British ships were switched off. (Why this was done is one of the mysteries of the entire operation). The Muâvenet-i-Millîye now crept down along the shore and the Allied destroyers failed to detect her. Only at 0100 hrs were two of these destroyers, HMS Beagle and HMS Bulldog, sighted – but astern – and Goliath was spotted directly ahead. The Turkish vessel’s advance was now noticed and Goliath signalled a request for the night’s password. It was too late. 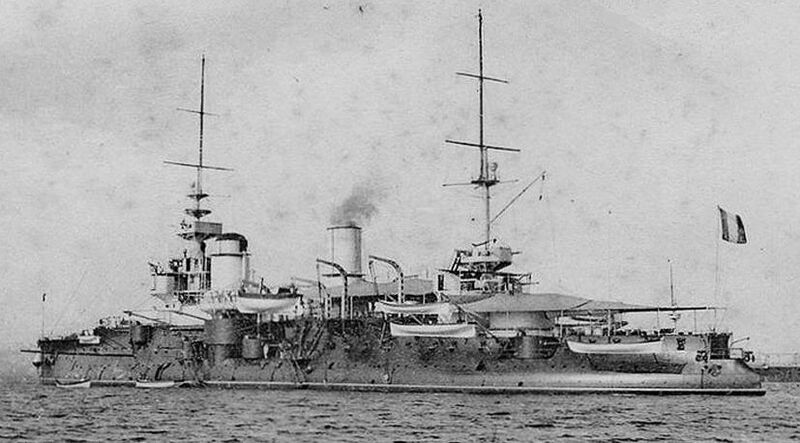 The Muâvenet-i-Millîye was in torpedo-range and she launched three torpedoes. They proved to be equally spaced along the pre-dreadnought’s length – one hit below the bridge, a second below the funnels and the third near the stern. The Goliath capsized and sank almost immediately, so quickly in fact that 570 of her crew of more than 700 were lost, including the captain. The darkness and the fast current running – up to three knots – hampered rescue efforts significantly. The Goliath’s loss was to have serious consequences within the British Government, leading in turn to the immediate resignation of the First Sea Lord Admiral Fisher (who had conceived the Dreadnought and presided over the Royal Navy’s modernisation) and, shortly later, that of the First Lord of the Admiralty, Winston Churchill. Two more pre-dreadnoughts, Triumph and Majestic, were to be sunk in the next fortnight, triggering the decision to withdraw all heavy units. The long, painful journey to final defeat and evacuation was now well advanced. And the Muavenet-i -Milliye? She was to have an inglorious post-war career as an accommodation hulk until she was scrapped in 1953. But in her one night of glory she had changed history. 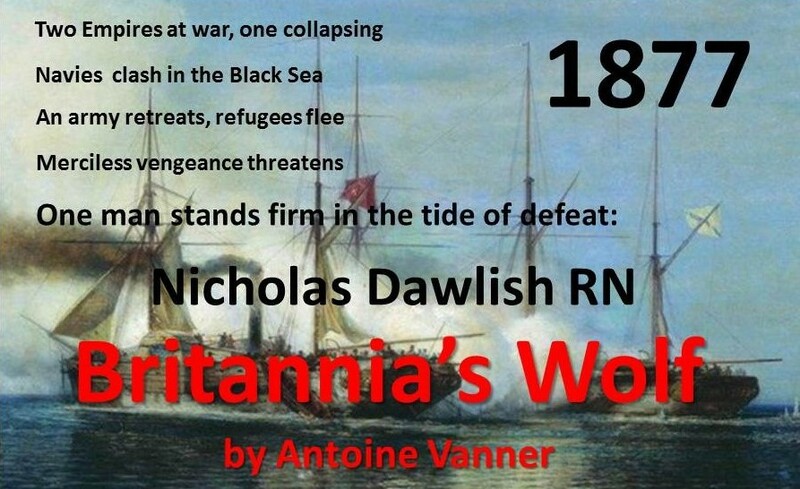 If you’re a Kindle Unlimited subscriber you can read Britannia’s Wolf, or any other of the six Dawlish Chronicles novels without further charge.They are also available for purchase on Kindle.